First Line: There were five detectives at our Sunday debriefing. Bestselling crime fiction author Nora Bannister has stumbled across a surefire money maker. She buys a dirt-cheap house in Los Angeles and writes a book about someone being murdered-- in that exact house-- while her business partners work their fannies off to turn it into a showplace. When the house goes on the market, buyers fall all over themselves bidding to own it. Only in LA, right? When two of Bannister's business partners are murdered, the LAPD doesn't know which angle to investigate. You see, both of the murder victims are also the wives of police officers. Is the killer after house flippers or cops' wives? Whichever angle is the correct one, Lomax and Biggs have to find the killer and find him fast because the next logical target is Marilyn Biggs, Terry's wife-- and she's one of the flippers. Sometimes I just want to laugh while I read about murder and mayhem, and when I do, I know that all I have to do is pick up one of Marshall Karp's Lomax and Biggs mysteries. The mystery is a genuine headscratcher, but most of the fun lies not in deducing the killer's identity, but in enjoying Karp's humor as he has a go at bestselling authors, the real estate business, interfering fathers, and life in Los Angeles. By targeting Terry Biggs' wife, Karp ratchets up the tension because, by extension, readers will wonder if that puts Mike Lomax's girlfriend in danger, too. These two homicide detectives certainly know how to make me laugh, so it's no secret that I don't want anything happening to their womenfolk. If you're in the mood for a belly laugh or two (or three or...) while you're trying to identify a killer, you can't go wrong by picking up a Lomax and Biggs mystery. 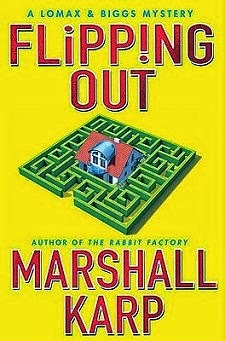 Marshall Karp is a master at creating fast-paced, suspenseful mysteries that will have you laughing so hard that the people around you will annoy the stuffing out of you by constantly interrupting: "What's so funny? Hey... read it to me. I want to know why you're laughing so much!" Cathy - Marshall Karp is one of the authors whose work I really like and always wonder why it doesn't get more notice than it does. He's got such a great sense of wit, and I like the relationship between Biggs and Lomax. They're terrific characters. You've hit the nail on the head, Margot. Karp is such a talented writer, I simply cannot understand why he's not more popular! Wow, do I ever need this book now. Surrounded by introspective, reflective, depressed characters or tales of 1930s famine, I'm desperate for humor. Camilleri's Treasure Hunt helped for a day or two, but now I'm eager for some laughs. I agree. It certainly does sound like you need a large dose of Funny right now! I've been doing serious for too long again. I'm reading Aunty Lee's Delights now which is amusing and fun, and I think more funny reading is in order. I'm positive that it is. I think you'll get just as big a hoot out of BUTA as I did (and do)!